Only 3 ingredients and they are delicious! 4 oz Cream Cheese, you may add up to 8 oz, I just like the consistency best with 4 oz. Dipping Chocolate, almond bark is my favorite because it hardens faster and quicker and doesn't melt as easy as chocolate chips after it sets up. Chop Oreos up finely in a food processor. Save some of the finely crushed Oreos for garnish later and set it aside. You don't need too much. With hands (or a spoon, I just think hands are faster), mash softened cream cheese and crushed Oreos until well combined. Roll into 1" balls and place on a wax covered cookie sheet. Put in freezer for 15 minutes. While balls are in freezer, melt chocolate according to directions. 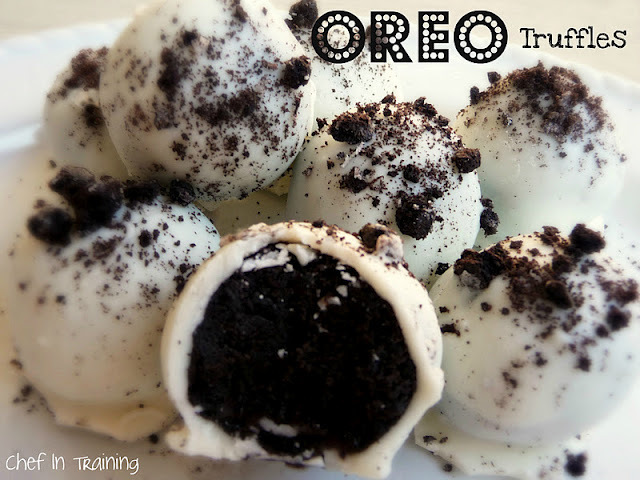 Pull the Oreo Truffles out of freezer, and dip into chocolate. Garnish with reserved Oreo crumbs before the chocolate sets up. Let chocolate set, refrigerate and enjoy!